Lazy eye, also referred to as amblyopia, is a condition that develops in infancy or early childhood, and it typically starts when the focus in one eye is more enhanced than the other. The eye with less focus might be impaired due to a significant amount of farsightedness or astigmatism, or something could be obstructing light from getting through like a cataract or debris in the back of the eye. Amblyopia may also develop due to an ocular misalignment known as strabismus, in which one eye turns inward or outward, keeping the eyes from focusing together on an object. This can cause double vision. In all of these cases, the brain receives two different images—be it one blurry and one sharp visual of the same object, or two completely different visuals. In order to compensate, the brain, over time, learns to ignore the image it receives from the impaired or deviated eye, causing vision in that eye to weaken to the point of permanent visual deficiency. A complete eye exam is recommended for all children between the ages 3 and 5. However, if your child is younger and you have a family history of amblyopia, or notice that his or her eye wanders inward or outward, or if the eyes do not appear to work in unison, it is important that you seek out an opthalmologist or optometrist sooner. A lazy eye can be corrected and vision can be gained with eye patches, eye drops, prisms, contact lenses, glasses, surgery, or vision therapy if a diagnosis is made early and treatment is administered. 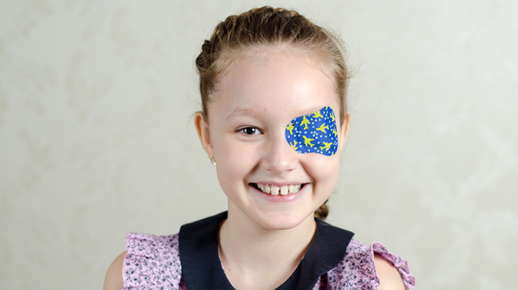 Amblyopia is more challenging to treat after the child has passed the age of 7 or 9. Regarding treatment, the first step may be to rectify any underlying problems in the “bad” eye before applying a patch over the normal functioning eye. While the child will have difficulty seeing with only the weaker eye at first, vision will eventually improve as the brain is forced to use it. This can take weeks or months. If the child’s amblyopia is mild, the optometrist might solely recommend using atropine in the functioning eye, rather than wearing a patch. The eye drop helps dilate the pupil and blurs the vision in the normal working eye, which causes the malfunctioning eye to do most of the heavy lifting, figuratively speaking. Many children with a lazy eye will also need glasses or contact lenses to assist with focusing. Should the child have a cataract or debris behind the eye that is blocking light from getting in, surgery may be needed to remove the blockage. Surgery or visual therapy may also be needed if strabismus is present and severe. Operating on the muscles of the eye, or performing certain eye exercises, will allow the eyes to move together.